Opening the Sky: Celebrating Sand! 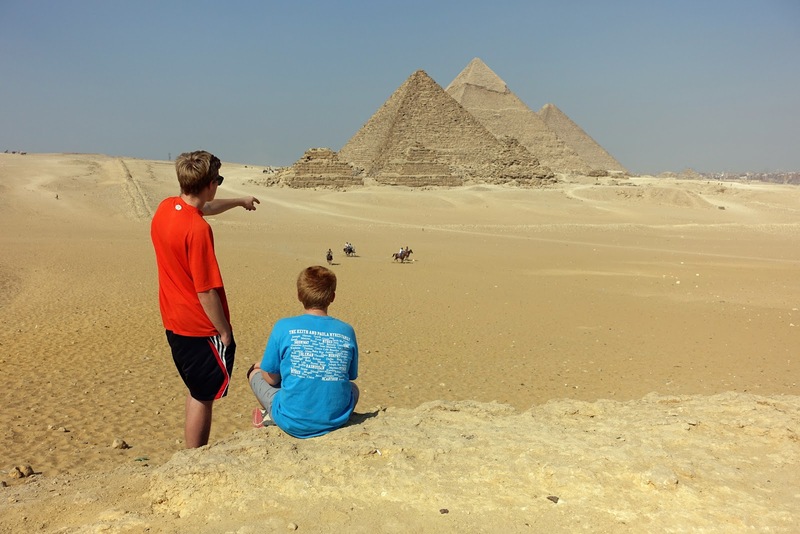 One of my favorite pictures in the Egypt desert--with two of my sons. The endless expansiveness of the desert creates lessons every time I go. Looking out at the vistas of sand in Qatar, I always see inherent possibilities of beauty. I know that with a periodic desert rainfall, unexpected treasures await. Underneath the sand there are dormant seeds, nourishing the hope of becoming glorious flowers. From the most unlikely desert wildernesses, beautiful vegetation can be cultivated and enjoyed. Conversely, sand reminds me to bury old grumblings and hurts, and not dig them up--forever allowing piles of sand to cover them. Underneath the sand there are seeds of splendor and sorrows. You can choose what you want to see on the sand dunes. It's February, and I still find it strange to not walk on newly soft snow. But I have come to realize that life always has compensations and other pleasures to enjoy when you are living in unfamiliarities. If you come to live in Qatar, you must celebrate sand--to slide. sled, jump, hike, dance, and run in the dunes. As children love to play in sand piles and sift the sand through their fingers, we too here in Qatar become children again in the sand. 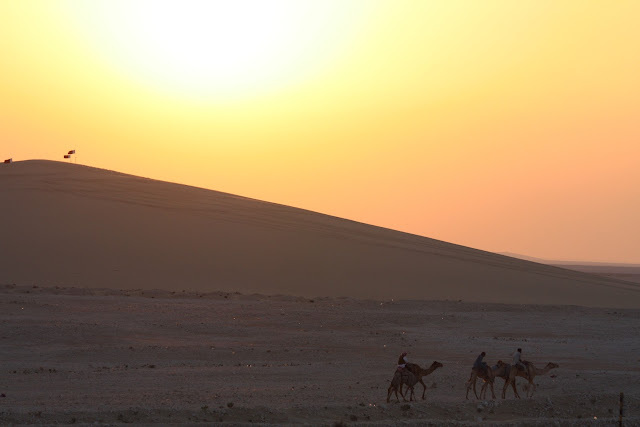 To climb the slopes of vertical sand in the Qatar desert and view the expansiveness of the world on a dune is renewing, healing. Only seeing everlasting sand for miles around on a sand dune is to know a new kind of freedom--a place where there is nothing to encumber or hinder you. Nothing blocks your views. Nothing. Elias, cruising down the sand dunes at a party in Qatar. The Dunes are called, "The Singing Sand Dunes," a place when you slide or sled down actually rumbles around you. Sometimes, depending on the place you choose to go down on the hill, the sand dune sounds like it is roaring, thundering. 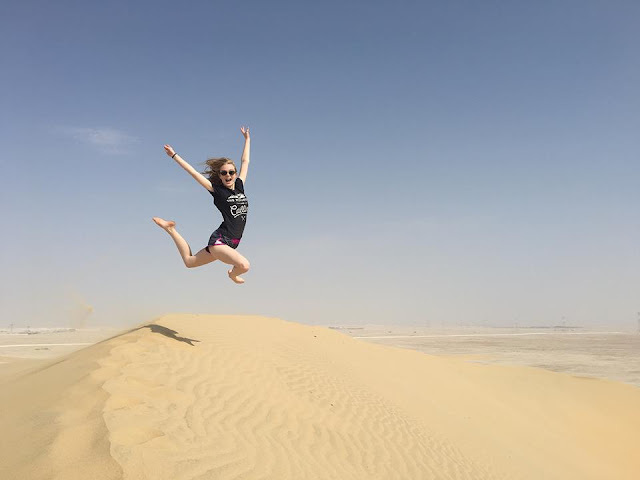 This is a video by Megan Jean Hansen, taken on a beautiful February day in Qatar. Elise leaping for joy on a sand dune. The desert, a landscape of sojourns and wandering for centuries, is for me a place of grandeur. It may appear bare and desolate, but it holds a world all it's own--a setting to unearth good things for the soul. Also, it is a spot to shed not only possessions you want to discard, but fears or doubts-- burying them deep in the sand. The desert can reveal other trajectories, helping you to navigate your path. You can see far distances on top of a sand dune. The possibilities are endless. Zach, gathering the wisdom in the desert.